The 398 students arrested at the White House on Sunday protesting the Keystone XL pipeline are inspiring more protests across the nation, as opponents of the controversial project ramp up their activism in anticipation of a final decision from President Obama later this spring. On Monday morning, nine more students were arrested for a sit-in at a State Department office in San Francisco, California. 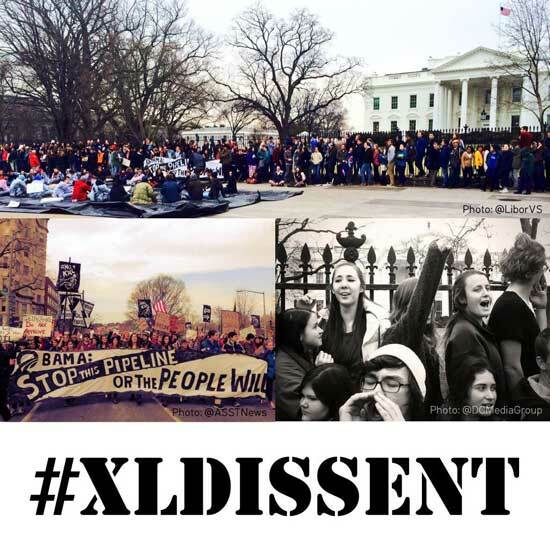 The activists called their protest “XL Dissent West,” to echo the larger XL Dissent action that happened in DC over the weekend. This Wednesday, pipeline opponents in Boston are expecting upwards of 100 students and community members to protest outside of a fundraiser President Obama is hosting in the city. More than 86,000 people have signed the Keystone XL pledge of resistance, organized by CREDO Action, Rainforest Action Network and The Other 98%, committing to take part in civil disobedience if the State Department determines the pipeline in the country’s national interest and recommends President Obama approve the project. The XL Dissent protest in Washington, DC, which turned out over 1,200 students from more than 100 schools the country, was particularly inspiring for other young people, thousands of whom tuned in to watch a live-stream of the event online and have been sharing photos of their friends who were arrested across Facebook and Twitter. This entry was posted in Uncategorized and tagged #XLDissent, Boston, DC, President Obama, San Francisco, XL Dissent. Protest by Protect Mustangs. Bookmark the permalink.